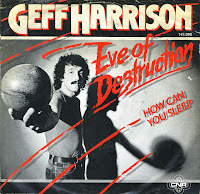 'Eve of destruction' was written by P.F. Sloan in 1965 as a grave warning of imminent apocalypse, and considered by some to be the epitome of a protest song. It expressed the frustrations and fears of young people in the age of the Cold War, Vietnam, the nuclear arms race, and the civil rights movement. The most famous version of this song was recorded that same year by Barry McGuire. It earned him a worldwide hit. This version was recorded and released in 1984 by the German singer Geff Harrison. It updates the Sixties track a bit, although it can hardly be considered a very Eighties version.